← Dollar Cost Averaging Investment Strategy – success based on luck? 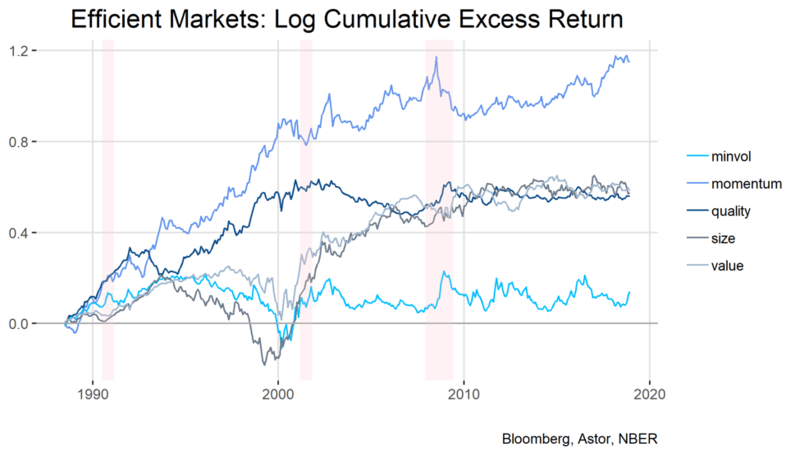 Factor investing has been around in portfolio management for some years. Based on algorithmic rules it became the big thing in trading and the ETF industry. But is there still some money to be made? Is small beta still smart or just beta? This article will give you a Tradesignal framework to test the factor investing ideas by your own. Buy and hold has been a profitable approach in investing. But customers ask for more. So technical analysis came around and held up the promise that market timing is possible. As the returns did not match this promise, algorithmic trading was invented. Clearly defined rules made it possible to backtest any given strategy, and if done properly, the returns equal the ones promised during the backtest. But this requires a lot of intellectual power and relies on cheap execution, so these returns are usually not available to the public. The general idea is to invest only in a part of the market, so not to buy and hold every stock contained in the index, but only those with high momentum, low volatility.. and so on. As this can be done quite easily, smart beta ETFs with a good expense ratio have been published. They promise excess returns or at least uncorrelated returns, so every John and Jane Doe can put together a portfolio according to his/her investment ideas. Unfortunately, with this massive interest in factor investing, markets priced in the edge originally given by some simple sorting algorithms. Now every big player has got a factor strategy running, and if everybody does the same, nobody is there to pay the bill. 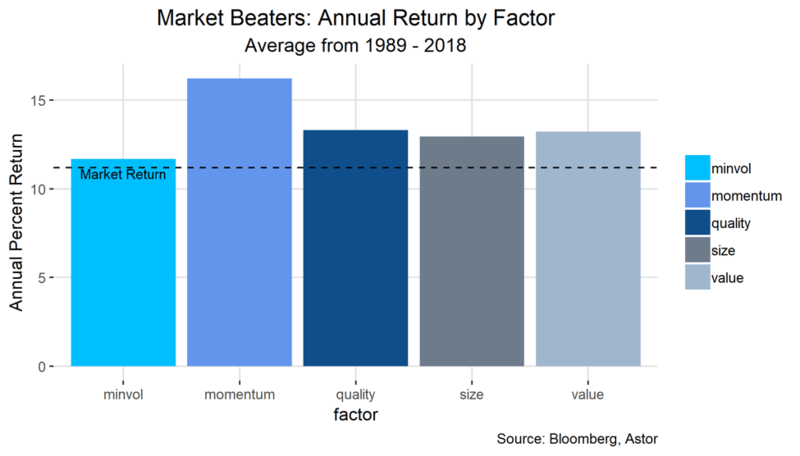 So over time the excess returns diminished, and as it is always in trading, only the fast and wise ones are still able to generate excess returns. As an investor I would like to have excess returns all the time, but as can been seen above, some factors are highly dependable on the current state of the market. betting on the size /market capitalisation of a company has been profitable most of the time, but not in 2000. According to the chart above momentum seems to be a more stable approach. 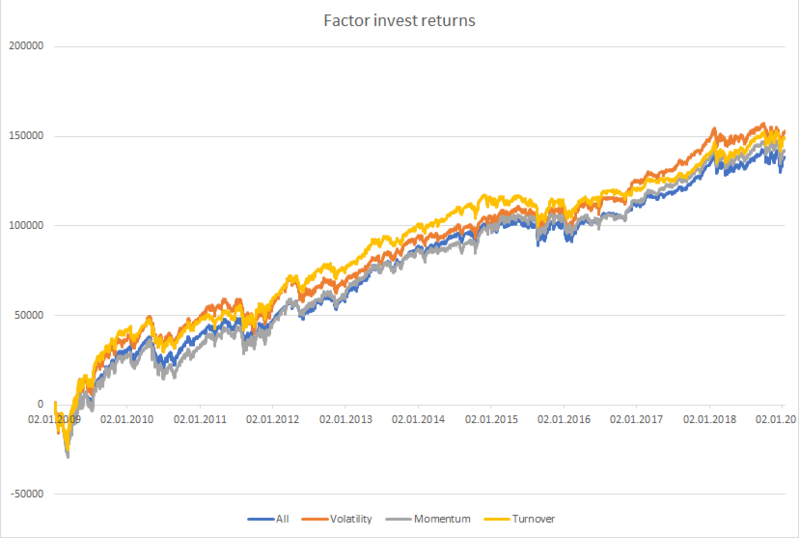 The Tradesignal factor investing framework provides an easy way to test your own stocks for the factor approach. Are factors working with your portfolio, do they provide any edge? It is always best to test by yourself. 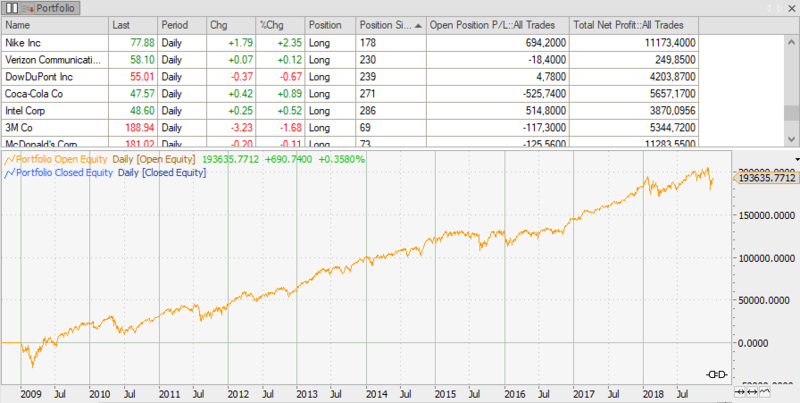 The chart below shows the returns of some sample factor strategy, trading with an 100.000$ portfolio and investing in 15 out of 30 stocks. 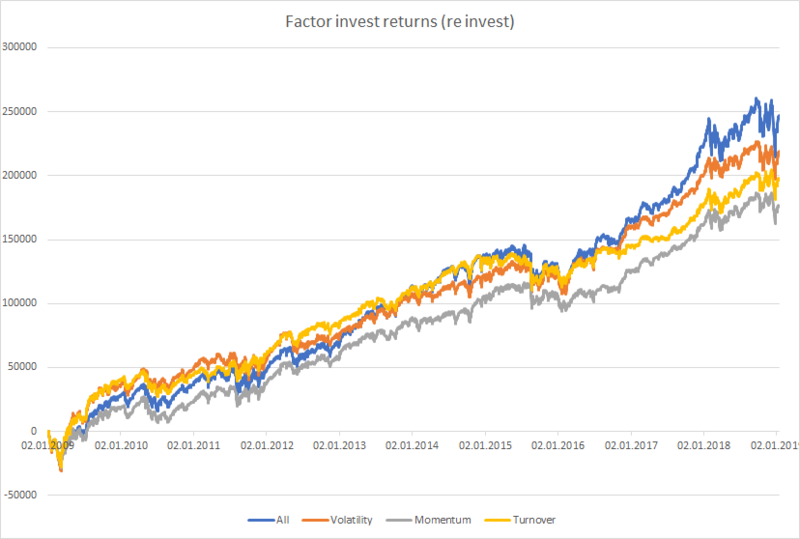 Comparing different factors with a re investing 100.000$ portfolio shows the differences between the multiple possible factor selections. The provided Tradesignal factor framework can test portfolios with up to 110 stocks, and has several factors to choose from build in. You can select min/max volatility, momentum, turnover … as a selection criteria and also decide if the returns should be re-invested or not. Using a drop-down menu the factors can be selected within the Tradesignal framework. This enables you to comfortably compare different factors and different stock sections. The portfolio will always contain the top/bottom 50% of all stocks contained in the selection list. The money invested can be set by the user. Tradesignal version 9 has to be installed. The backtest will work without limitations, live signals will only be issued up to June 2019. If in trouble contact me.